A while back I posted about how much I love scents comprised of vanilla mixed with citrus notes. One of my all time faves of this combination is Fresh Sugar. Over the years there have been various flankers to the original Sugar scent, but none have come close to the original. The latest flanker is more of a departure from Sugar, because it is meant to resemble the company’s Brown Sugar bath and body products; the most famous being their Brown Sugar Body Polish, of which I’ve used jar upon jar, since its main ingredient is sugar, rather than salt. It also does not contain a considerable amount of oil, like many of those salt/oil scrubs that make you feel as if you’ve immersed your body in a Fry-O-lator. Plus, it does not sting you skin, especially after shaving, when you would literally be rubbing salt into your wounds. And it does smell exactly like firmly packed brown sugar, with the slightest hit of lemon. 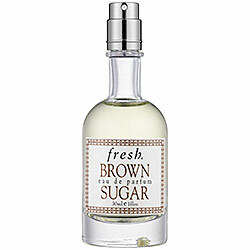 Brown Sugar Eau de Parfum is complimentary, but it is not identical to the scent of the scrub. The notes are (courtesy of Sephora): Sicilian lemon, tangerine, açai berries, sugared magnolia (Grateful Dead, anyone? ), honeysuckle, peach nectar, caramel, warm amber, cypress. The combination mimics the signature body products scent, but departs from it with the addition of peach and the subtle florals, but the vanillic caramel and the warm amber notes in the EDP make it that much more delicious. It was love at first sniff for me, and I’d been chomping at the bit to smell this one ever since I heard it was created. It is sold in cute little 1 oz. bottles and 1/4 oz. roll-ons, but I would love oh, something more in the way of a liter size to spray with abandon. Yes, I love it that much. I’ve long been a fan of Fresh, dating back to the late 90s-early 2000s when their product line was significantly larger, and they had many more scents that were so fabulous, they were sadly ahead of their time. There was a trio of chocolate-based scents I adored that were named for famous operas, as well as their cutesy Mukki and Jus scents that I couldn’t get enough of, in addition to a lineup of about 30 or 40 different eaux des toilettes. Their Milk line of shower gels made me give up soap in the shower forever, and I loved giving their colorfully wrapped soaps as gifts around the holidays. Sadly, like many niche brands, their product selection has dwindled significantly, but the quality is still there. Everything I’ve ever tried by Fresh has been top-shelf, but unfortunately, much of it is now beyond my current price range. I’m not terribly disappointed, since most of my favorites, including the Milk line, Mukki, Jus and those phenomenal chocolate scents, have all been discontinued. They hit a home run with Sugar though, and the scents, bath and body products are always front and center in every Fresh display in any Sephora I’ve ever been in. I’ll always love Sugar, and now Brown Sugar, and I have a feeling I’m far from alone in that. But what I wouldn’t give for some of those old favorites I used to get in their Upper East Side and SoHo stores in New York City. Visiting them was like a trip to Willy Wonka’s Chocolate Factory. I was always in heaven whenever I flitted through, and I never walked out empty-handed. Fess Up Time: What niche beauty and fragrance brands/products do you miss? What would you “sell a kidney” to get a hold of if you could? Disclosure: I sampled Fresh Brown Sugar at Sephora. Oh man, where to start…on the makeup front, I will forever miss the divine Fiorucci in New Yrok. i used to practically live there as a teenager and loved its disco eye powders — long before anyone else was doing iridescent and metallic sparklers…and Mary Quant! especially her whacky lipsticks. Also, Borghese used to make the most fantastic cosmetics, sigh lovely quality. sigh. Perfumes: Aside from a mournful fixation on my discontinued adolescent favourite, Avon Lemon Velvet, I would donate at least my tonsils and perhaps my spleen for a bottle of Gobin-Daude Nuit au Desert. Andy Tauer’s Orris could claim my appendix. Mary Quant lipsticks! I still miss those, and the little blushers, and of course the packaging. Not really niche, just great. OMG – the era of Mary Quant, Stagelight and Barone. I used to love all those. And I’m convinced the BeneFit sisters ripped off Stagelight’s Rose Blush for their BeneTint. I was also into Borghese cosmetics for a time, because my mother used them. I would regularly steal her mascara. I feel your pain on the Borghese – I am still mourning their incomparable Etruscan Gray eyeshadow. Yes, I still remember the name even though I have not seen a palette of it in 20 years! I’m just now in the process of discovering Fresh. Haven’t tried Sugar yet but it’s on the list. I like the Cannibis line with the grass & hay undertones. Cannabis Santal is the only Fresh scent I don’t care for. It’s way too similar to Angel for my liking. However !! the smell of sugar and molassses around the cane mill towns in northern Australia would have to be one of the most downright sexually maddening tormenting things it is possible to experience…sort of hot burnt yet dirty mossy-mouldy caramelly, as they bring in the burnt-off sugar cane and then crush, boil, process it…maybe its just memories of my missspent rampantly hormonal youth manhunting in the wilds of Queensland that does it…I’ve had a couple of wines, better not get too carried away! Parf Generale did some French can’t remember the names series lately that has a GORGEOUS brown sugar thing (Sucre d Bene??) (compared to Killians ‘Love’ on Katie Puckrick), but to me it comes seriously close to the cane mills and I will just have to have it. I don’t think Fresh ever came to Australia, but since I live in the sticks I probably would have missed it anyway…although Strawberrynet does carry bits of the line and I will stalk it there too – serious lemming now, dammit!! Oh, running around in the nightime at Airlie Beach, calling out to silly brolgas (big storky kinda birds) that thought that since it was full moon, they should be wandering around making haunting mating calls…and the smell of rum and burnt sugar in the hot tropical night…I rarely think about winding back the clock, but there have been unforgettable times! I’m coming down there to hang out with YOU! Your part of the world sounds so lovely and you write about it so evocatively – way better than a buncho 3:-os mooing and deer running through town (very unnerving. Nobody wants to hit a deer and the site of them running through the vegetable gardens (not ours, we have Rottweilers) is enough to freeze your blood. I’m coming with you, snakes and crocs be damned. I am utterly fascinated by that part of the world! Hey Musette, we have a Rottweiler too, but all she gets to run off is the dog down the street who poops in everyone else’s yard (not ours). Actually, all she wants to do is play with him, but he doesn’t have to know that. I wish they would bring back Love’s Fresh Lemon, but maybe that’s because I’m roasting under a combination of Washington DC summer and my own “personal summer” these days. I first met the Fresh line in San Francisco, at Gump’s. That was my intro to Fresh Lemon Sugar (for $22, thenkyewveddymuch). I feel in LOVE! and to this day, always keep a bottle of that in my arsenal. I was gifted with a jar of the Brown Sugar body polish and have never looked back – that stuff is wonderful! Hi Nava, great post. And Musette, that’s so funny about the Pomegranate Anise — that was one of the Fresh Index ones that really worked for me. Oh well, that’s chemistry for you. Not to sound like a broken record, but I really miss the late, great vintage Cartiers (Must EDT, EDP, Must II EDT & EDP). You can get them on eBay at times but it will cost you dearly. I treasure the few bottles I have. And I sorely miss the wondrous Chanel lipstick in Shanghai Red. I see the dwindling tube in my purse and I’m ready to cry. And by the way, giving a HAPPY BIRTHDAY shout-out to March!! Hope you’re having a wonderful day, sweetie!!! Thanks Ann! The scrub is great, and the scent is quite different than the EDP. You should try it! Ann, I LOVE Pomegranate Anise! Strangely, though, while it seems like it ought to be a great summer scent, I really love wearing it when I’m going outdoors on a cold winter night. Somehow, catching a whiff of Pomegranate Anise on the cold winter air is just perfect! I have a barely used bottle of Pomegranate Anise that I more than willing to part with if you or anyone else wants to swap…. A – the vast majority of the Index scents were discontinued. And thank you for the reminder, because I forgot that was what they were called! Baby, I’m with you alllll the way on that one. One of the interesting things about a reduced-simolean lifestyle is that you find all sorts of things that work Just Fine – for way less. To wit: my $3 Rimmel lip pencil beat out my $22 Laura Mercier pencil, hands down. Perfect color, perfect coverage and blendability, etc…..I am IN LOVE! But! That being said – what I bemoan is the loss of my Heavy-Simolean Lifestyle. Ah, well. It will come again, anon. Speaking of things that work fine for way less: I make my own brown sugar body scrub. I am not a super crafty type but this could not be easier. I washed out an old body scrub tub and literally just fill it with brown sugar and some oil (extra virgin olive oil, jojoba oil, almond oil, or all of the above). I also spritz in a little perfume (you could spritz in the Fresh Brown Sugar! ), not enough to leave a scent on my skin, just enough to make it more luxurious. Works great for me. I’ve actually even used this on my face, though then I skip the perfume. Great idea! Although, I just picked up yet another 10 oz. tub of St. Ives Apricot Scrub for $4.99 on sale at Shoppers Drug Mart. I really can’t complain about that stuff – it’s the best face scrub I think I’ve used. As for body, shower gel and a Bath & Body Works gauze shower sponge are nothing to swing a stick at, either. I really, really miss Fresh Grape & Vine. They discontinued it about a decade ago and I would be insanely happy if I could find a bottle somewhere. I would fork over a kidney and a few feet of intestine for those chocolate scents I mentioned. I could spare a kidney and even cut my hair short for a FB of the REAL Apres L’Ondee EDP. And by the way, as I found out yesterday with a layover in Paris, they only sell the EDT bottles in the store on the Champs Elysee. Even if you’re in France, dealing with Charles de Gaulle airport, you still can’t get that juice! I thought the duty-free shops at de Gaulle airport were nirvana for perfumista. Alas, I have never been there, so I’ll take your word. I got a sample of the Fresh Brown Sugar last time i was in Sephora – like it a lot, but it was very short-lived on me. Would definitely need to bathe in it – I do love the refreshing lemon opening! I feel like I’ve sniffed most of the Fresh line that is in Sephora (I am blissfully ignorant of the Index and other discontinued scents), but don’t think I’ve smelled Sugar or Lemon Sugar. Next time! The lasting power on me was actually decent. Not tenacious by any means, but decent for a citrus-based scent. Consider yourself lucky that you never smelled many of the Index scents. Some of them were pretty stellar. Thank the perfume gods that my bottle of Fresh Index Pomegranate Anise was one of the few things I did NOT give away the last time I moved! My Cucumber Baies, however, is long gone – sigh! I always wear dark wine-brown eye shadow as a sort of soft eyeliner. Ordinary brown looks dead on me, and plums are always too blue. The shades I love NEVER stick around. Over time, I’ve used Revlon, Borghese and Lancome, and I’m currently on Chanel Nova, which is discontinued. I’ve still got one stashed away, but I guess it’s time to start searching for a replacement again. Aveda purefumes and products before they were bought out by Estee Lauder. They had some really great fragrances in the early 90’s. I especially miss the original Love oil. The original Curessence conditioner and leave in spray were amazing too. *SIGH* Darn you Horst Rechelbacher for selling out! That’s very fastidious article. Thank a lots for talking almost it as I am interested in this individual.